Thread: Rear tyres - even wear or what? Both are worn almost down to the tread indicators so time for a new pair. Note the fitting damage on right hand side tyre, caused by the tyre fitter applying improper technique and too high pressure when beading tyre. New tyres will be Maxxis MA-P1 175/55 R15 for more comfortable ride and improved fuel consumption. Note the fitting damage on right hand side tyre, caused by the tyre fitter applying improper technique and too high pressure when beading tyre. This is a wind up right? the tyre fitter....... you have been driving around like this? points make prizes......... how many miles did they last? I've passed MOT several times on these. Got only 35000 miles out of this rear set of Continentals so not particularly happy. Noticed rear end was wagging its tail a wee bit at low speed so jacked up to inspect, then found the damaged tyre. Getting a new pair of Maxxis tomorrow, meanwhile running on winter tyres to stay mobile. Another thing: The worn Continentals looked rather small in diameter compared to the winter tyres I just fitted. Difference in outer diameter slightly above 1 inch. My continentals have 87000km and they're still OK - The fronts are almost new, and the rear ones will need changing in about 2000km. I might change wheels soon although, just can't seem to find any Corelines or Strikelines. You should have discovered the damage to your tyre long ago! Don't you check your tyres at least weekly when you've got your car in the air busy doing something to it? Shame on the MOT testing station who should have spotted and failed this obvious 'accident waiting to happen' ! I don't think that part is actually covered by the MOT. When I did my driving test, I learnt that for the tyres to be legal they have to have 1.6mm of tread across the centre 3/4's of the tyre with no cuts or bulges in the sidewalls. It's scary that that section of tyre doesn't seem to be included when it could potentially have led to an accident! Tolsen: Are your Winter tyres the same width and profile? Didn't realise that but it definitely makes sense. I can't believe they could miss something like that then! That ply/cord showing is nothing to do with how the tyre was fitted. It's just worn down past the tread. 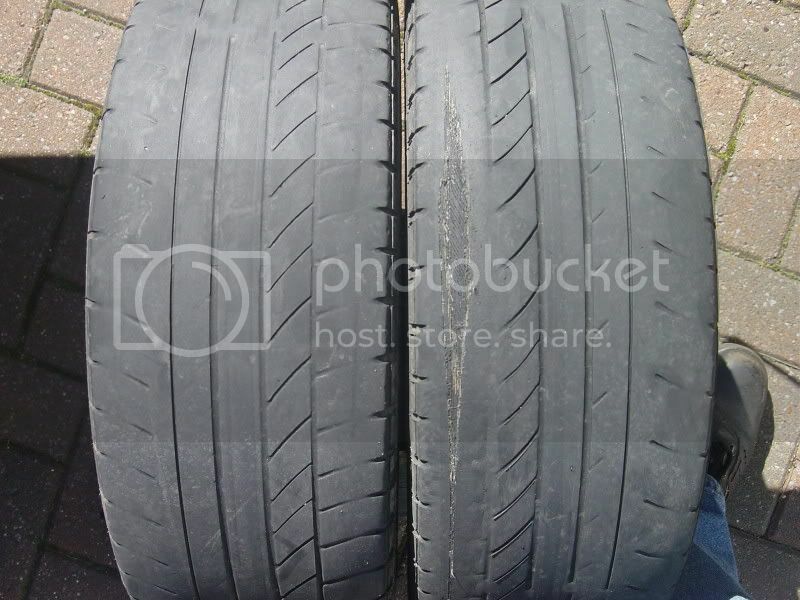 They look like both tyres have worn on the outside edges, whcih suggests they have been slightly under inflated for most of their life. BTW those tyres are not "nearly" worn to the tread indicators, to my eyes, they both look WAY PAST that! -They're practically bald! In any case, 35k is a really good mileage from a set of rear tyres. I'm lucky to get 20k from a set!